I recently subscribed to ProfHacker in my Google Reader. There are a good variety of posts and with plenty of good tips on using technology in the classroom. Last week there was a great post by George H. Williams on using Wordle in the classroom. Wordle is a free online tool that creates editable word clouds from text that you provide. I stumbled across Wordle sometime ago and immediately started seeing great uses for it. 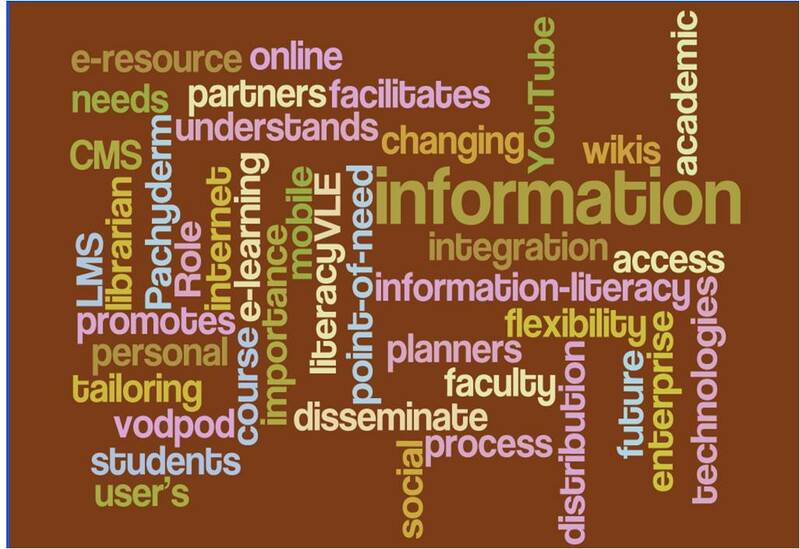 This past summer I used Wordle to create a visual representation of words describing or pertaining to the work of an e-learning librarian. It was an eye catcher. Folks wanted to know how I made it and wanted to know if they could use it too. Yes, it is completely free. I haven’t used it yet in instruction, but the ProfHacker post has got me thinking of ways we could use it. One idea I have is to create a Wordle to help discover good keywords. Two possible scenarios. First, have students write a short summary of their topic and paste it into Wordle. Working with a summary as opposed to a single sentence question could help draw out keywords that students have missed. Second, copy the text of an article that seems really pertinent to a student’s research project and allow Wordle to show you the best keywords to help you expand your search. I might just have try one of these next semester.